With the rapid expansion of the number of hosta cultivars available to the gardening public over the past several decades, there has been a great need to find a way keep track of them all. As might be suspected, many of the cultivars vary only slightly from one or, in some cases, many other similar hostas. If you explore Mark Zilis' book, The Hostapedia, you will see many instances where he declares that two cultivars are actually the same plant but under two different names. In an attempt to help gardeners and professional horticulturists differentiate between all of these plants, The American Hosta Society went through the process of establishing an International Registrar for the Genus, Hosta. The Registrar is appointed by the International Registration Authority for the Genus, Hosta which is part of the International Society for Horticultural Science. The first Registrar was Mervin Eisel who served from 1974-1992. He was followed by David Stevenson (1992-2000), Dr. Jim Wilkins (2001-2004), Kevin Walek (2005-2015) and Gayle Hartley Alley who became the Registrar in 2016. _ A. Registrar's Role - There is a certain amount of misunderstanding when it comes to the role of the Registrar. His or her responsibilities are pretty narrowly defined as to what they can and cannot do during the registration process. Perhaps the key area of confusion regards the Registrar's role in determining the merit, worthiness, uniqueness or stability of a new hosta cultivar. To put it bluntly, they have NO real role in judging if the plant being registered is truly something new and worthy of introduction. They may point out similarities to other cultivars but, in the end, it is up to the registrant to proceed. So, if you look at a new, big, blue hosta cultivar and wonder why it was allowed to be registered since it looks just like 400 others, it is not the Registrar's fault. What the Registrar does is to make a permanent record of the name and description of the cultivar so it is kept in a central location. When someone has a new hosta cultivar which they would like to register, they complete a form, add a small registration fee and send the information off to the Registrar. He or she then checks to make sure that the application fulfills the requirements of the International Code of Nomenclature for Cultivated Plants. There are specific guidelines for the form and number of words that may appear in a hosta cultivar's name. The Registrar also checks the records to make sure that the name has not already been used by another registered plant. d) Registered (filled out the forms) the cultivar. All this information will help establish "ownership" of a particular cultivar. In some cases, the same name(s) appears in all four categories while in some, all the people are different. Finally, each year, the Registrar publishes an announcement that lists the cultivars approved for registration during the previous year. This constitutes the public notification that the registrations have taken place. Only at that time is the cultivar considered officially registered. _ B. Why Not Register a New Cultivar? - Zilis (2009) estimated that there were around 7,500 different named hostas out there in the world when he published his book in 2009. However, only about 5,000 of them had been registered. Even that number has been somewhat inflated by the fact that The American Hosta Society and certain individual Hostaphiles have made a concerted effort to go back and register many of the older cultivars. Several hostas have been registered on behalf of deceased originators and some cultivars of unknown origin have been registered by the AHS itself. For example, several of the fine blue, 'Tardiana' hostas originated by Eric Smith in England back in the 1960s have been registered posthumously on his behalf by the British Hosta and Hemerocallis Society and others.
. It takes too much effort to fill out the registration forms.
. I'm just in it for a hobby and don't like having to conform to other people's rules.
. I named the hosta and gave it to a few friends but it really does not warrant registration.
. The origins of that cultivar are long forgotten and nobody knows anything about it. Mr. PGC Comment: According to several sources, the American Hemerocallis Society has around 60,000 registered daylily cultivars. As I understand it, it is almost unheard of for someone to introduce a new daylily and NOT register it. What a difference. Why the difference? _ C. Plant Patent - Yes, just like any other "invention", a new hosta cultivar may be patented. This process involves the U.S. Patent Office and has nothing to do with the registration process of The American Hosta Society discussed above. If a plant is successfully patented, anyone other than the owner of the patent who wants to propagate it must pay a royalty for every new plant produced. Just like other patents, there is a time limit as to how long the owner has exclusive control over the plant. The classic hosta, H. 'Royal Standard' was the first one to receive a U.S. patent. It was obtained by Wayside Gardens when they were still a nursery in Ohio back in 1965. 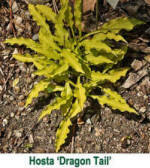 H. 'Solar Flare' by Henry Ross of Ohio was the second patent granted to a hosta. That happened in 1981. There are now over 51 hosta cultivars that are protected by U.S. patents with more going through the process each year.